The goal of the Encyclopedia of Life (EOL) Project is to predict structural information for all proteins, in all organisms. This calculation presents challenges both in terms of the scale of the computational resources required (approximately 1.8 million CPU hours), as well as in data and workflow management. While tools are available that solve some subsets of these problems, it was necessary for us to build software to integrate and manage the overall Grid application execution. 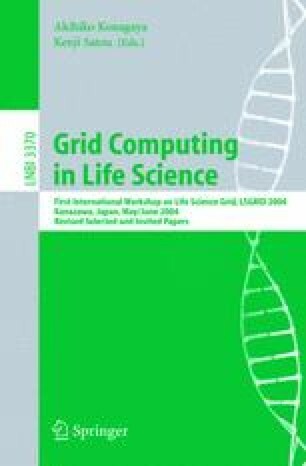 In this paper, we present this workflow system, detail its components, and report on the performance of our initial prototype implementation for runs over a large-scale Grid platform during the SC’03 conference. This research was supported in part by the National Science Foundation under the NPACI Cooperative Agreement No. ACI-9619020 and under award No. ACI-0086092. W.W. Li, is also supported in part by PRAGMA, funded by NSF Grant No. INT-0314015, and Systematic Protein Annotation and Modeling, funded by the National Institutes of Health (NIH) Grant No. GM63208-01A1S1.